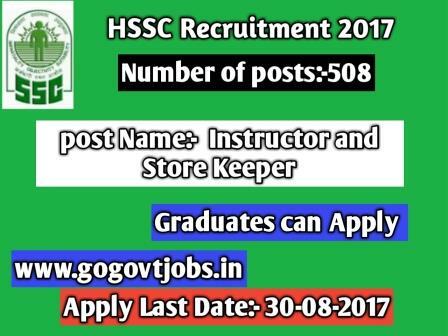 Candidates who waiting to work these HSSC they may apply this post online 30-08-2017. Haryana Staff Selection Commission (SSC) is an organization under Government of India to recruit staff for Various post in the various Ministries and Department of the Government of India and in Subordinate Offices. 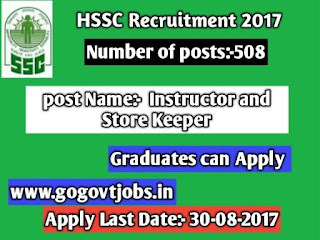 Vacancies Filled Under :- Haryana Staff Selection Commission Recruitment 2017. Education Qualification :- Only those candidates are eligible who have passed in Graduation in relevant subject. Age Limits :- candidates are limit should to be possess minimum age 17-42 years . performance in various round of selection. The Various rounds of selection are as follow. Selection will be held on Written Exam. Selection will be held on VIVA.